High rates of ALS on Guam may have been caused by the native people’s predilection for eating bats, according to a new theory. Two researchers proposed the theory based partly on observations that the bats — a delicacy among native Guamanians — eat poisonous nuts from the indigenous cycad tree. "If we’re correct that an environmental toxin in the diet causes [ALS] among the people in Guam, it might lead to an investigation of environmental toxins — including dietary ones — elsewhere," said one of the researchers, Paul Alan Cox. Cox is director of the National Tropical Botanical Garden in Kalaheo, Hawaii, which is chartered by Congress to conserve tropical plants and identify plant-derived medicines. He and Oliver Sacks outlined the theory in the March 26 issue of Neurology. A best-selling author, Sacks is a neurologist at Albert Einstein College of Medicine in New York, and has examined ALS patients on Guam. Between 1940 and 1965, ALS among native Guamanians — the Chamorro — reached 50 to 100 times its worldwide incidence, and became the Chamorro’s leading cause of death. In most cases, it was associated with Parkinson-dementia complex (PDC), a disorder that combines the tremor of Parkinson’s disease with the memory loss of Alzheimer’s. ALS-PDC wasn’t found among non-native Guamanians. Today, pure ALS and ALS-PDC among the Chamorro have dropped to less conspicuous levels, suggesting that the trigger for the disease — something specific to the Chamorro lifestyle — has come and gone. 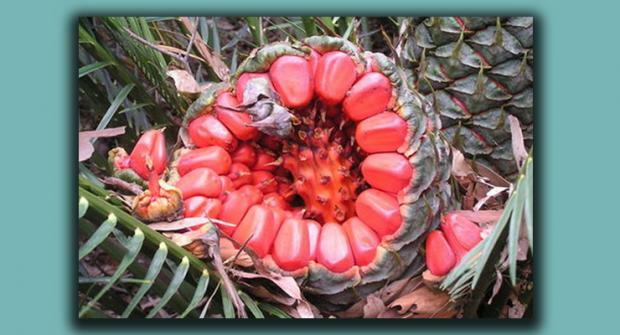 Cycad nuts, which are used by the Chamorro to make flour, were once a prime suspect. After studies showed that toxins from the nuts could cause neurological damage to animals, the use of cycad flour declined. But other studies revealed that the Chamorro had always known about the toxins and were efficient at removing them during flour preparation. To most scientists, the cycad seemed off the hook. Research turned away from the Chamorro diet toward possible genetic risk factors. But Cox kept digging. "Knowing that the only significant correlate with ALS-PDC in Guam was consumption of the Chamorro diet, I said ‘What else do these people eat that no one else in the world does?’" he recalled. The answer: the fruit bat, boiled in coconut milk and then consumed from head to toe — a meal usually reserved for special occasions. Since the bats feed on cycads and eat twice their body weight every night, their tissues could accumulate levels of toxin much higher than those in cycad flour, Cox said. The theory also explains why ALS on Guam peaked after World War II, and then steadily declined, he said. The war brought money and guns to Guam, revving up the bat meat market. By the mid-1970s, steady hunting and consumption had nearly extinguished the bats, and Guam began importing bats from Samoa, where there are no indigenous cycad trees. At its peak, ALS affected some 400 per 100,000 Chamorro, but now that the cycad-eating bats have disappeared, the rate is down to about 22 per 100,000. Cox says the connection needs to be tested. Future studies should probe for cycad toxins in preserved and extant fruit bats from Guam, and investigate the eating habits of certain native tribes in New Guinea that have a high incidence of ALS, he said.